WIKILEAKS has made several announcements over the past three months that indicate it will be the Fifth Estate that finally takes down the hopelessly corrupt Clinton Campaign. Julian Assange has made it clear that the current Wikileaks cache of hacked emails is so radioactive that they essentially constitute the neutron bomb that will take down the entire Obama Administration. A neutron bomb does just that—it takes out all life leaving the buildings perfectly intact. In the present case of the Wikileaks secret weapon, “Phase Three Of Its Election Coverage” promises to complete the job before November 8th. It’s a funny thing the story surrounding Julian Assange. The UK, US and Sweden have kept him locked up in the Ecuadorean Embassy for over 4 longs years under threat of a patently false and purely political prosecution. In the meantime Assange has succeeded in taking down the once ‘invincible ‘ Hillary H. Clinton. No, she’s not out of the race just yet, but she will be VERY soon. Because the Obama Administration, the British Government and Sweden were so intent on delivering Assange to an American kangaroo court, they permitted him to focus his energies on the greatest download of documented evidence of government corruption in modern history. What a stellar achievement this has been for the U.S. FEDs. In their zeal to lock up a real whistleblower, they have empowered him to singlehandedly take down the whole U.S. Federal Government. While it is still standing, it won’t be for long. Obama & Company are to receive their comeuppance very soon indeed! The preceding link contains enough hard evidence that it is probably equivalent of 1000 Watergates. Most people do not really get how serious this categorical Wikileaks evidence really is. These are emails written by the very perpetrators themselves. And Clinton Campaign Director John Podesta is at the very center of the whole criminal enterprise … right along with career criminal Hillary Rodham Clinton and her partner-in-crime Barack Obama. Paul Combetta was hired to modify the email headers that referred to a VERY VERY VIP individual, i.e. change the name of who it was from. If you read Stonetear/Combetta story, it’s easy to see this is exactly what he was attempting. He wanted to change header information on already sent mail to show “state.gov” instead of Hillary’s private email address. Multiple people informed him of the infeasibility (and illegality) of it, so somewhere in the next 6 days it was decided that simply eradicating them was the only option left. For the uninitiated this breakdown essentially says that President Barack Obama is stone-cold guilty of crimes and cover-ups that would make Watergate look like a walk in the park. For the unbelievers, what follows is another little bombshell from the Wikileaks treasure trove regarding Hillary Clinton’s official misconduct while Secretary of State. The following Wikileaks item ranked number 3 on the “Top 100 List”. If these revelations don’t completely terminate Hillary Clinton’s candidacy, certainly four straight years of Congressional Emailgate hearings will, should she outright steal the election from Donald Trump on November 8th, or shortly thereafter. Truly, if the “Top 100 Wikileaks” do not bring down the entire Obama Administration, nothing will. 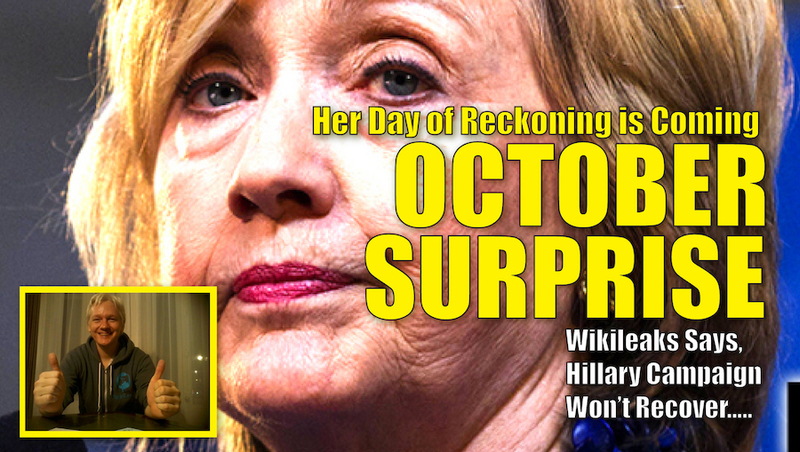 For those who still doubt the sheer incriminating power of the Wikileaks emails, rest assured that the coming phases of releases will put the final nail in the HRC political coffin … maybe even today on what may be a very momentous Halloween. And a very HAPPY HALLOWEINER to all! HOW CAN HRC CONTINUE TO RUN UNDER THE VERY REAL THREAT OF CRIMINAL PROSECUTION? !